At Freeway, fashionalism is not just about Philippine fashion. It’s about dedication and commitment. 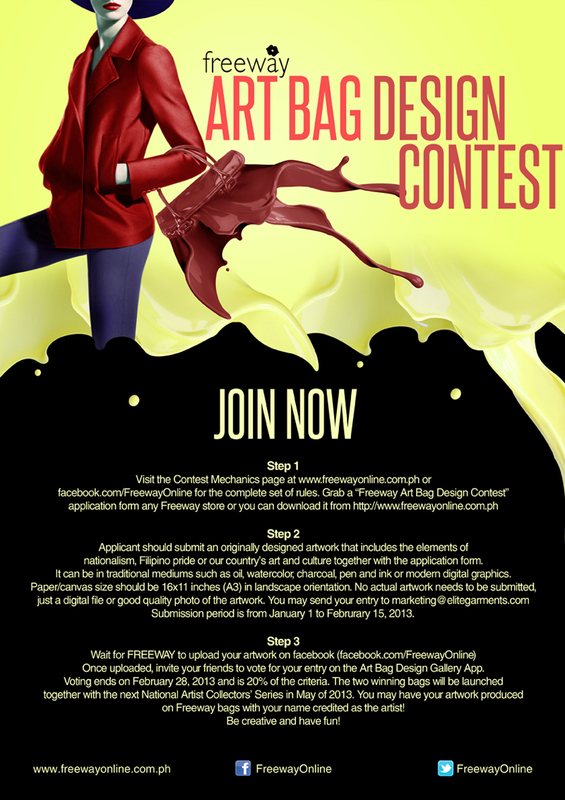 This January 2013, Freeway is starting the year off right and grand by sharing its mission to champion the spirit of fashionalism as the brand launches its first ever Art Bag Design Contest. The competition encourages young creative minds to showcase Filipino talent and fulfill Freeway’s vision to showcase Philippines Art & Culture through innovative interpretations. Let your creative minds and nationalistic heart work together. Submit your artwork! The winning designs will be put into production as part of Freeway’s National Artist Collector’s Series Fall 2013 in May together with the featured National Artist which has yet to be revealed. To enter the competition, submit an originally designed artwork that includes the elements of nationalism, Filipino pride or our country’s art and culture together – it can be digital image, photo of own artwork in different mediums (pen and ink, oil, watercolor, pastel and others). All approved submissions will be uploaded on Freeway’s Facebook Page for voting which is 20% of the criteria. The 2 grand winners will not only receive the satisfaction of seeing their artworks with their names on the hangtags in Freeway stores as part of the National Artist Collector’s Series Fall 2013 but each winning designer will also receive a 16gb iPad Mini and Php 10,000 worth of Freeway Gift Certificates. Learn more about Freeway’s Bag Design Competition in website www.FreewayOnline.com.ph and Facebook Page facebook.com/FreewayOnline. Join and be part of the historic National Artist Collector’s Series!